SuperBot modular robotic units self assemble into larger structures, such as this humanoid walker assembly. One of the most challenging issues for human-centeredlong-range space exploration is performing complex tasks in environments thatare not human-friendly.... the traditional approach of building separate robotsfor separate tasks (such as the CanadaArmand surface rovers) may no longerbe adequate for affordable space exploration as the required robotic tasksbecome diverse and the need to pack many functionalities into a single launchvolume increases. Dr. Shen proposes theSuperBot modules as a way to meet this goal. 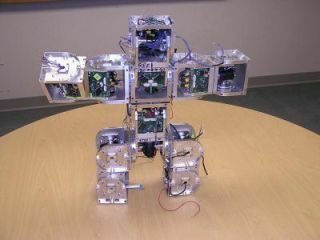 Each module is a "robot"in its own right, with microcontrollers, sensors, communications, power supply,three degrees of freedom and six connecting faces to dynamically connect withother modules [image].At launch, or when landing, SuperBot can pack itself into a minimum amount ofspace. Upon arrival, SuperBot canunpack itself and take any of a wide variety of forms. For example, it mightform several exploration rovers, one SuperBotcapable of rolling down hill [image,video],another twisting "sidewinder-style"over level sand while another forms a SuperBotclimbing robot to take on more challenging terrain. SuperBot will help NASA toreduce costs and simplify operations by reusing robotic components from missionto mission. If the robotic modules are truly interchangeable and interoperable,the need for redundant parts on a given mission can be reduced, thus loweringpayload mass and cost. Mission reliabilty and safety would be enhanced, sincethe modules themselves would know how to perform tasks, and would require lessactive direction from astronauts or ground crews. Dr. Shen hopes to have his100 module SuperBot operational and ready for testing in a desert environmentby 2008. Each ten centimeter cube is an autonomous unit with a microprocessor and a set of instructions on how to link themselves with other modules. This bot is a prototype member of an autonomous nanotechnology swarm that can alter their shape to flow smoothly over rocky terrain. Read moreat the SuperBot press release and in this short SuperBot project abstract (pdf).